Toes in the sand, not a cloud in the sky, 75 degree water temps. Vacations are the prefect time to decompress, spend precious time with family and friends and reconnect with your soul. What could possibly stress your body? How about ten days of sleep on a mushy mattress? Or two hours of novice water skiing/body dragging lessons. Not to mention the bottomless Mojito’s and obligatory trips to the dessert buffet…and don’t forget nursing that nasty sunburn from day three. Unfortunately, stress doesn’t take time off. The scenery may change, but your nerve system is still hard at work – reacting and adapting to those “relaxing” shifts in routine. Its a prime opportunity to become Subluxated. If you’ve been away from the office for a while, we hope you’re well rested. But now it’s time to get back on track and into a healthy regime; especially getting your spine checked and cleared of Subluxations. 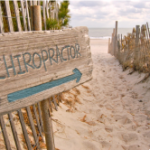 When you need to recover from vacation – put Chiropractic on top of your itinerary. Next post: Did You Hear?